In 1960, Jeg Coughlin Sr. founded JEGS as a small speed shop. It has grown into a high performance powerhouse that includes a race team, 250,000 square foot warehouse, two retail stores, mail order, and website. And with JEGS, customer care is #1. We love JEGS. 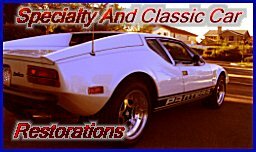 They are SACC Restorations’ go to speed shop for anything on our car. We highly recommend them for any project, big or small. Check out their crate motor selection; you won’t be disappointed.